The Egyptian Cabinet has indicated it will order the dispersal of sit-in protests for ousted President Mohamed Morsi, declaring it will take “all legal measures necessary to confront acts of terrorism and road-blocking”. Morsi’s supporters have occupied Nahda and Rabaa El-Adewaya Squares since late June, just before the President was overthrown by the military. “Based on the mandate given by the people to the state, and in preservation of the country’s higher interest, the Cabinet has delegated the interior ministry to proceed with all legal measures to confront acts of terrorism and road-blocking,” said interim information minister Dorreya Sharaf El-Din in a Cabinet statement Wednesday evening. “The Cabinet has reviewed the country’s security situation and has concluded that the dangerous situation in Rabaa and Nahda Squares, including the terrorist acts and road-blocking that has occurred, is no longer acceptable as it constitutes a threat to the country’s national security,” Minister of Information Dorreya Sharaf El-Din said. Minister of Interior Mohamed Ibrahim announced on Saturday that the police and the army were working in coordination to discuss a suitable day for dispersing the tens of thousands of protesters at the sit-ins. Ahmed Ibrahim, a Minister of the Qaddafi regime, has been sentenced to death by a Libyan court. Ibrahim, who held senior positions including Minister of Education minister, was found guilty of inciting violence against the opposition during the 2011 uprising that toppled Qaddafi. A judge found Ibrahim had urged residents of Sirte, Qaddafi’s hometown, to form armed gangs and fight insurgents. Ibrahim’s lawyer said the ruling must be confirmed by Libya’s supreme court. In a sign of further distancing between Hamas and Iran, the Islamic Republic has sent aid via a rival faction in Gaza, Islamic Jihad. Relations between Iran and Hamas have been strained over the Syrian conflict — with the Gazan organization moving away from the Tehran-backed Assad regime — and the November 2012 invasion of Gaza by Israel. On, Tuesday, the Islamic Jihad Relief Society began distributing Iranian food aid valued at $2 million, with dozens of men and women lined up in front of trucks carrying pictures of the Iranian flag. Islamic Jihad officials said they planned to distribute food packages containing cooking oil, rice, sugar, canned food, and school supplies to about 40,000 people. Tunisia’s largest labour union, the Tunisian General Labour Union (UGTT), called on Tuesday for the dissolution of the Government. The Ennahda Party, the largest faction in the coalition Government, said it was ready for a new administration; however, it opposed any move to disband an elected body that has almost completed work on a new draft Constitution. Protests have surged after last week’s killing of leftist politician Mohammed Brahmi, the second political assassination in six months. The powerful UGTT, with 600,000 members in the public and private sectors, said a technocratic government should replace the one led by Ennahda. “We consider this government incapable of continuing its work,” Hussein Abbassi, head of the UGTT, said in a statement. While endorsing demands for the Government to fall, the UGTT has also opposed dissolving the Constituent Assembly. Tunisia’s largest labour union called on Tuesday for the dissolution of the Islamist-led government and the interior minister offered to resign as a political crisis deepened. Softening its rejection of demands for the government’s departure, the Islamist Ennahda party said it was ready for a new government, but opposed any move to disband an elected body that has almost completed work on a new draft constitution. Protests against the moderate Islamist Ennahda party surged after last week’s killing of a leftist politician, the second to be slain in six months, disrupting a tense political transition that began when Tunisians toppled an autocratic leader in 2011. While politicians feud, the army is struggling to contain Islamist militants, who killed eight soldiers on Monday in a mountainous region near the Algerian border in one of the bloodiest attacks on Tunisian troops in decades. The powerful Tunisian General Labour Union (UGTT), which has about 600,000 members in the public and private sectors, said a technocratic government should replace the one led by Ennahda. While endorsing demands for the government to fall, the UGTT has also opposed dissolving the assembly – a measure which would throw Tunisia’s fragile transition process into limbo. “We propose maintaining the Constituent Assembly but … with a time-frame to speed up completion of its work,” said Abbassi, general secretary of the UGTT, which brought much of the country to a halt with a one-day strike on Friday. The secular opposition, energised by the overthrow of Egypt’s freely elected Islamist president this month, has stepped up pressure on the Ennahda-led government to quit. Some opposition leaders were dissatisfied with Ennahda’s offer to form a new government but keep the Assembly in place. Following nation-wide protests in June, Turkish officials have announced that no loans will be granted to students who engage in “resistance, boycotts, occupations, writing, painting [in public spaces], chanting slogans and the like”, as this is a “violation of the right to an education”. Many students joined mass demonstrations last month, sparked by Government plans to re-develop Istanbul’s Gezi Park. 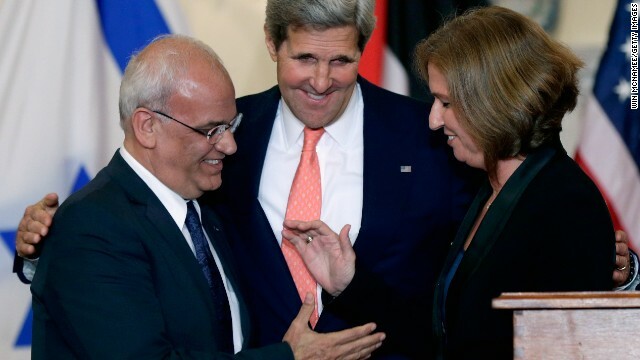 Kerry spoke to reporters after he hosted a discussion between former Israeli Former Minister Tzipi Livni and Saeb Erekat, the chief negotiator for the Palestinian Authority, in Washington. He said the two sides will now meet in either Israel or the Palestinian territories. [The two sides] have agreed that all the final status issues, core issues, are all on the table for negotiation. And they are on the table with one simple goal: a view to ending the conflict, ending the claims. Palestinians have suffered enough, and no one benefits more from this endeavour than the Palestinian people. I am happy that all final status issues are on the table. In these negotiations, it is not our intention to argue about the past, but to make decisions for the future. It is our task to work together, so we can transform a spark of hope into something that is real and lasting.